In this newsletter we are going to talk about the pros and cons of each type of flooring for your pets, but there are a couple things you need to keep in mind. You know your pets. You know whether or not they have accidents, shed often, or have sharp nails. In the end you are the best judge when it comes to deciding what flooring you and your pet can handle. It can be tempting to just choose the cheapest flooring option, but it’s important to remember that cutting corners on quality to save money is not a good choice if the flooring will need to be replaced in a year – or even a few months – due to the wear and tear from pets. Value is a key word to remember when shopping for flooring; the price will be reflected in the quality. Hardwood is not a good choice for homes with heavier pets or those with sharp nails because they can scratch or dent the wood. However, the higher end hardwoods typically have a better protective layer to help prevent this. Spills are easy to clean but must be done quickly and properly. Tile is nice to have if your pet has lots of accidents because spills are easy to clean. However, the grout can harbor bacteria and stain. Tile doesn’t usually scratch easily because of its hard surface but it can be uncomfortable for little paws. Cork is good for accident-prone pets (as long as spills are cleaned properly) because it is antimicrobial. It’s also more resistant to scratches than hardwood, however it has the tendency to chip if heavy or sharp objects are dropped on the surface. It’s naturally sound absorbent as well. Bamboo is the hardest of all “woods” but some manufacturers add a laminate surface which can be susceptible to scratching. Strand-woven bamboo is the best out of the different types of bamboo, for stain and scratch resistance. Luxury vinyl tiles and planks are highly durable, long-lasting, and resistant to moisture, scratches, and dents. They won’t react to even very high levels of moisture. Spills are very easy to clean, and if any boards do get damaged they can easily be replaced. Luxury vinyl is also much softer and warmer for little paws than hardwoods or tile. Carpet is usually not the best choice for a house with pets. However, we use a Stainmaster cushion with a built-in moisture barrier standard on all of our carpet installations that will help prevent wicking stains. 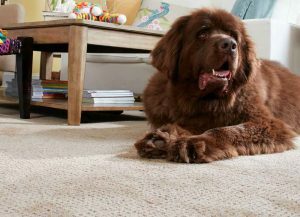 If you choose a loop-pile carpet, your pets’ nails may pick the fibers. It’s important to vacuum regularly, especially if your pet is prone to shedding. Laminate has a moisture sensitive core so accident-prone pets beware. However, it typically has a better wear surface than hardwoods (but not quite as good as LVT). The slick surface of laminate can cause your pets to slip and slide on its surface. Being educated on the different flooring products is the first step to making this big decision. The next step is coming into our store and talking with us! 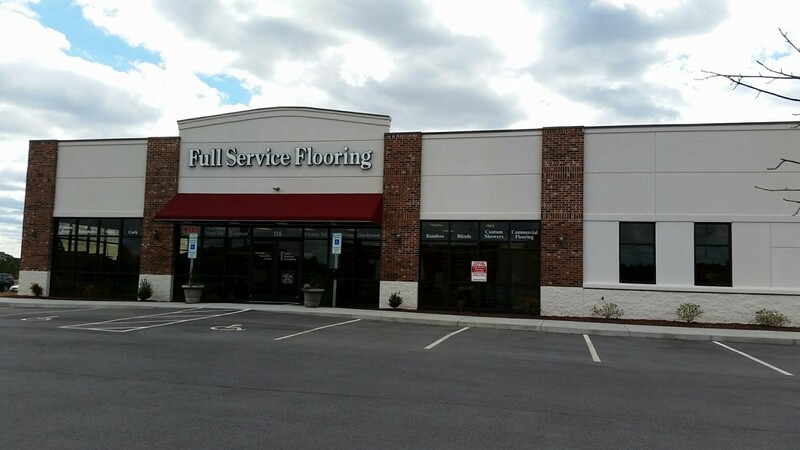 We will make sure you get the best flooring for you and your fur-babies at the best price. Have a brand in mind? Check out the product section on our website to see which brands we keep in store! This is from our April 2016 newsletter. Want to stay up to date? Subscribe!